Bethany is known for her attentive approach to training that focuses on communication and is founded in fostering a rich partnership between horse and rider. Bethany’s love of horses began at an early age. She has dedicated her life to learning the art of horsemanship from master horse trainers. She has studied classical dressage, liberty work, work in hand, and long reining. Her biggest teachers though have been the horses. Bethany has taken what she has learned from other trainers as well the horses, and combined in with her Christian faith to create a unique style of training based on love for the horse. 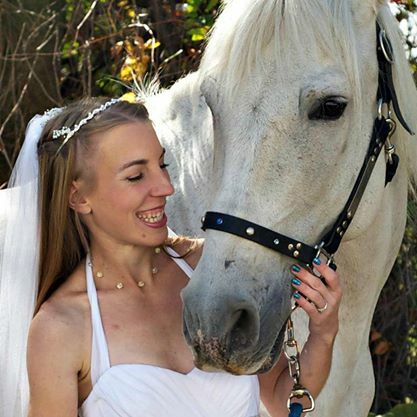 Bethany specializes in French Classical Dressage which focuses on communication and partnership with the horse. Everything is done in lightness and the horse is given the freedom to express himself. Bethany emphasizes building a strong foundation. Lunging and work in hand are vital to a successful partnership with your horse. Under saddle, the priority is developing a connection with the horse which creates a happy, willing partner. Executing commands with a lightness that provides the horse room for self-expression is key to earning a horse’s trust and encouraging an innate willingness to move forward with relaxation and impulsion. Bethany also specializes in lunge lessons for all levels of rider, which help the rider develop a balanced, secure position in the saddle. In addition to dressage work, Bethany is able to take her partnership with her horses to a whole new level by working with them at liberty, where there is nothing connecting her to the horse and the horse has the freedom to do as he wants. Working with horses at liberty creates a relationship with your horse that will transcend anything you have experienced before. Bethany enjoys performing with her Andalusian, Ilustre, at various shows and exhibitions. It is her goal to share her unique training style and show people how they too can take their relationship with their horse to a whole new level.